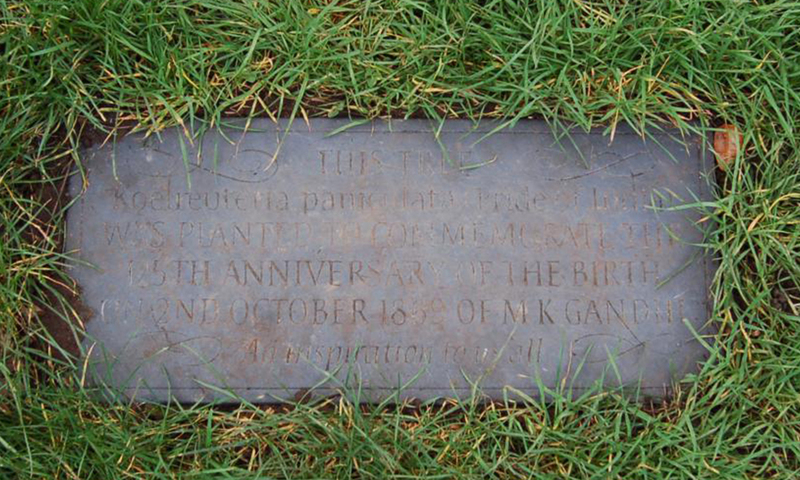 A slate memorial plaque, the first of its kind in the Parks, was unveiled in the University Parks on 13 July at the site of the tree planted in 1995, to honour M K Gandhi. Known as `the Father of modern India', the tree commonly known as Pride of India (Koelreuteria paniculata) commemorates the 125th anniversary of his birth which was on 2 October 1869. The plaque was designed and crafted by local sculptor Martin Jennings. It was unveiled by Mr Richard Symonds, a scholar of commonwealth history, who knew Mr Gandhi personally and worked with him on relief projects. The Indian Independence leader, who died in 1948, had many links with Oxford. He twice visited Balliol College in 1931 while in Britain for the famous Round Table Conference, and was involved in lively debates on the Indian constitutional question. In 1992 the Tolkien Society and the Mythopoeic Society organised the JRR Tolkien Centenary Conference at Keble College, Oxford. To mark the occasion and to commemorate the centenary of Tolkien’s birth, a special collection was held for the installation of a memorial bench and planting of two trees in University Parks. The trees represent Laurelin (a false acacia) and Telperion (a silver maple) from The Silmarillion. The tree representing Laurelin was accidentally damaged by a lawn mower and is now substantially smaller than Telperion. A second Laurelin was planted, but became diseased and was eventually removed when it died. 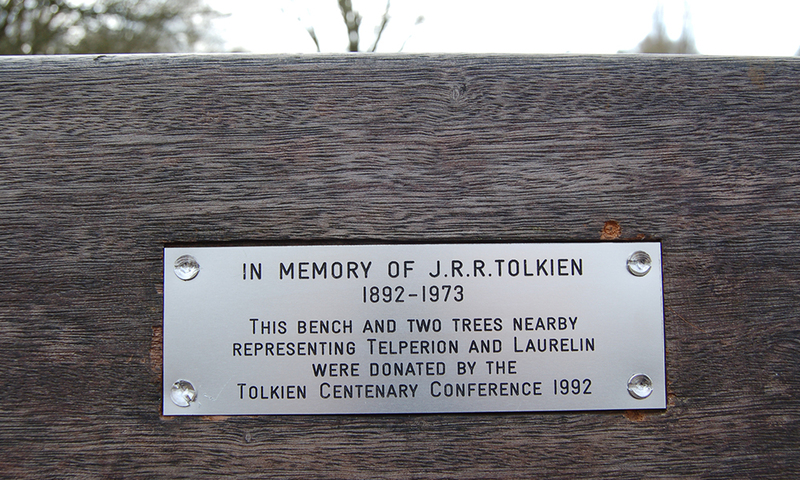 The Tolkien memorial bench was renovated in 2015, with a new layer of varnish and installation of a new plaque paid for by the Tolkien Society. The old plaque is now in the Tolkien Society Archive. 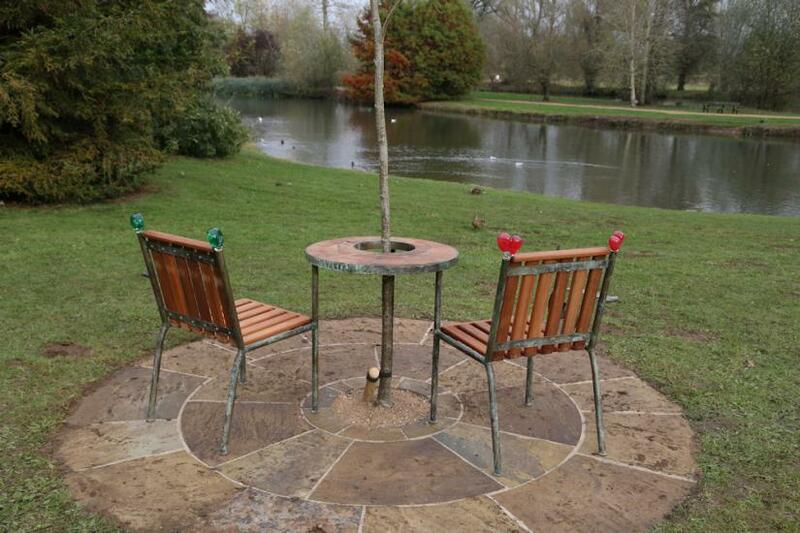 In November 2014, University Parks became the seventh place in the world to boast a Havel’s Place installation. The commemorative table and chairs which make up the installation are designed to evoke the memory of Václav Havel (1936-2011) − writer, thinker, human rights activist and President of Czechoslovakia and the Czech Republic. The unveiling ceremony coincided with the month’s 25th anniversary of the 1989 Velvet Revolution, which ended over forty years of communism (in what was then Czechoslovakia), of which Havel was a leader. Present at the unveiling were dignitaries from both the Slovak and Czech Republics, including the two nations’ ambassadors to the United Kingdom and four current Czech cabinet ministers. Havel had high regard for a number of people associated with Oxford University. Among them were the late philosopher, Isaiah Berlin and Timothy Garton Ash, Professor of European studies who witnessed the revolutionary events in 1989 and became a friend and confidant of Havel. The President received an honorary Doctorate of Civil Law from the University in 1998. Havel’s Place installations, designed by the Czech architect, Bořek Šípek, who was a friend of Havel, serve as a modest place of rest and contemplation and symbolise democratic debate. The Linden tree (Tilia of which there are 45 species hardy in Britian. The species selected is Tilia tomentosa ‘Petiolaris’ commonly known as the Weeping Silver Lime) which grows through the centre of the table is significant in the design for being the national tree of the Czech Republic. The table is inscribed with Havel’s 1989 campaign slogan, 'Truth and love must prevail over lies and hatred'. Oxford’s Havel’s Place is located in a quieter, more reflective area of the Parks to the west of the pond. The chairs swivel to allow the user to overlook the water, the adjoining copse of trees, or across the Parks to the city.